A creamy caffein-spiked Espresso Brownie Chocolate Smoothie made with fresh espresso, crumbled brownies, dates, cocoa powder and a splash of milk. You’ll be all over this chocolatey treat. Imagine your favorite fudgy dense chocolate brownies blended with some strong, brewed espresso and your favorite type of milk ( coconut milk works great, too and is vegan). Add some cocoa powder and dates. Blend away. 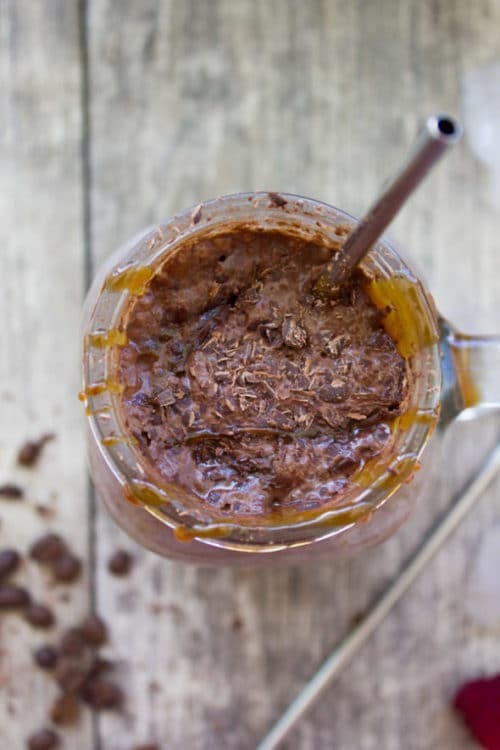 Serve this one of a kind chocolate smoothie with a drizzle of caramel sauce and chocolate shavings. It’s happening. I’m sorry. I know I know it’s not the time for this. It’s all about detox smoothies and detox everything. And I’ve been really good following up with salads and healthy foods. So good in fact that I needed this. YES, it just happened to call my name. I can’t help it. I made a batch of my ultimate Super Loaded Fudgy Brownies for a friend who came over for coffee. She happens to be gluten-free and so are the brownies—and that’s why they’re extremely rich, chocolatey and fudgy! P.S— You need to make it or go a touch extravagant with Caramel Stuffed Spiced Brownies. So I had the base for the chocolate smoothie. I didn’t feel like another milk and cocoa drink or chocolate milk, so I added in a shot of espresso. There’s something about espresso that makes me happy! The recipe for this Espresso Brownie Chocolate Smoothie can be summarized in one sentence: Blend all the ingredients until smooth and serve your Chocolate Smoothie up right away! This smoothie tastes more of a coffee chocolate smoothie, which is great—but I felt I needed to add in some milk. I used regular milk. But any type of milk would work great here—any! You won’t need too much milk unless you prefer a runny type of smoothie. I made mine quite thick, almost in between a pudding and a smoothie. 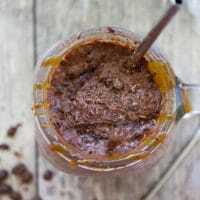 Speaking of pudding, this Instant Chia Chocolate Pudding is a hit with parents and teachers since my girls were young! To reinforce the chocolate taste (like it even needed that lol) I added some raw dark cocoa powder. I prefer a really deep chocolate flavor, not a milky chocolate flavor. So when you’re making your smoothie keep that mind, if you’re into a milk chocolate flavor, skip the cocoa powder. My chocolate smoothie gets a bit of sweetness from dates. To me, dates are like PURE magic. Medjool dates have an unbeatable smooth creamy texture, a perfect amount of sweetness and a mellow neutral taste. Plus an abundance of nutrients. So, whenever I want to avoid sugar yet need sweetness, I go for dates. Sometimes banana too, but the banana taste is overpowering so you’ll taste it—like in this chocolate banana cake. Or I use date bits like this Double Chocolate Date Zucchini Bread. This Espresso Brownie Chocolate Smoothie tastes amazing, you can vary it endlessly and it keeps in your fridge for ages! I always make a large batch and have some whenever I have a craving for something sweet. 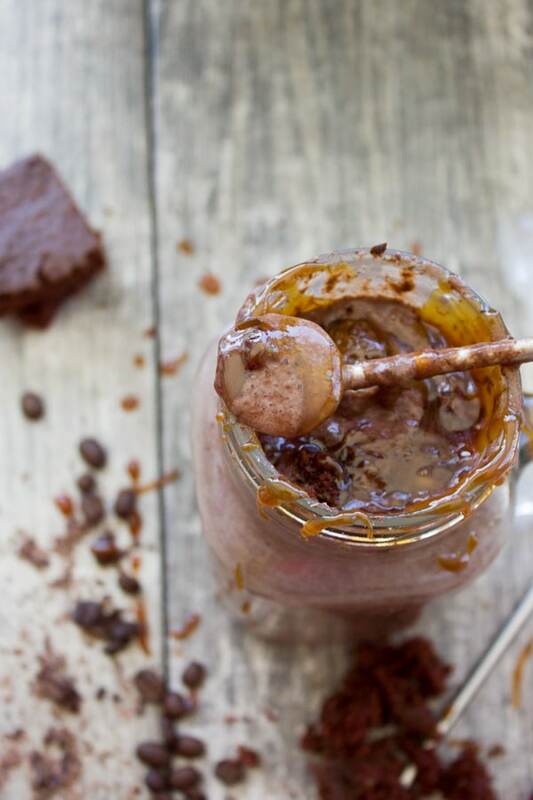 Try it out and be prepared to fall in love with this decadent Brownie Smoothie! If you want to make this Chocolate Smoothie in advance, you can store it in the fridge. Remember to give the brownie smoothie a nice shake or stir with a spoon before serving. 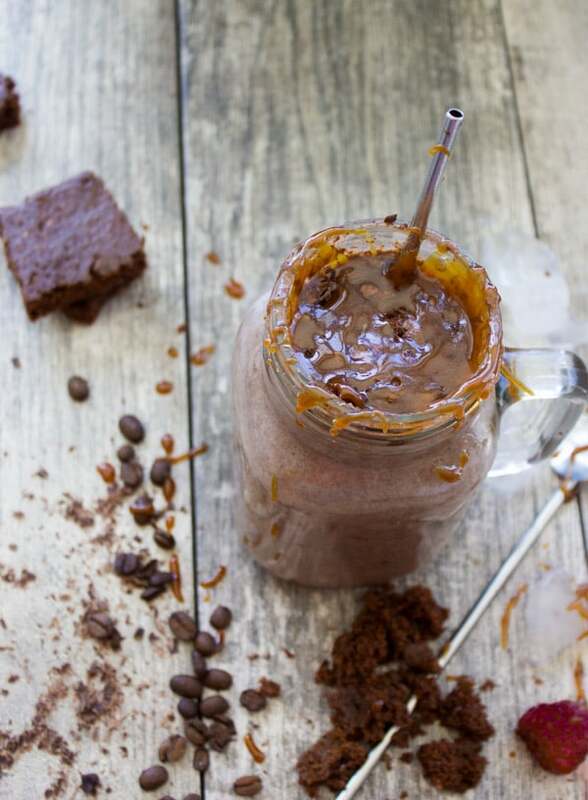 Serve this decadent Brownie Chocolate Smoothie up as it is, or close your eyes and drizzle some Homemade Caramel Sauce on top. Chocolate shavings? YES, PLEASE! A creamy caffein-spiked Espresso Brownie Chocolate Smoothie made with fresh espresso, crumbled brownies, dates, cocoa powder and a splash of milk. Kids and adults alike will be all over this chocolatey summer treat. Crumble up some homemade Super Loaded Fudgey Brownies. Or any other brownies you have on hand. In a power blender, place all the smoothie ingredients (no toppings) and blend until smooth. If you want to make this Espresso Brownie Chocolate Smoothie in advance, you can store it in the fridge. Oh this looks so yummy! 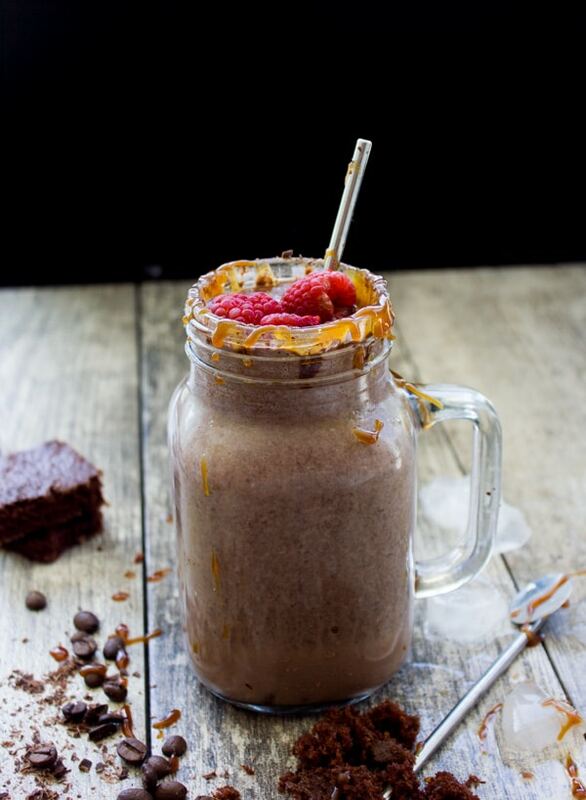 A brownie smoothie is a great idea! I NEED this right now…. Pinned. You have put allll of my favorite things in one tasty treat! I can’t wait to try one or five tomorrow! hahahaha I don’t blame you!! This looks Amazing, better than any dessert! This is my dream drink! I love everything chocolate! Oh my goodness!! I want ONE of these right now!! It sound ahhhhmaaazing!! What a decadent smoothie! Looks so yummy! A great way to start the day! It would also work as an afternoon pick me up.